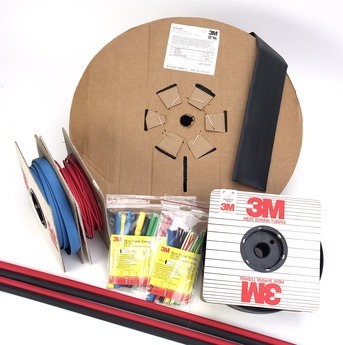 3M™ Heat Shrink Tubing FP-301 offers an outstanding balance of electrical, physical and chemical properties for a wide variety of industrial and military applications. This tubing comes in 100 ft spool and a quantity of 300 ft per case. 3M™ FP-301 is rated for 275°F(135°C) continuous operation. FP-301 tubing is typically used as a shrink-fit electrical insulation over cable splices and terminations. It is also used for lightweight wire harness covering, wire marking, wire bundling, component packaging and fire resistant covering. FP-301 clear tubing provides excellent visibility for component packing. 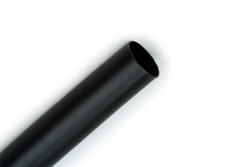 All FP-301 tubing is split resistant, mechanically tough, easily marked and resists cold flow. FP-301 is available in black, white, red, blue, yellow and clear in the standard lengths of 6-inch (15,2 cm) cut pieces, 48-inch (1,21 m) and small (8.5-inch core diameter) spools of 50 (15,24 m) and 100 (30,48 m) feet. Four-foot lengths of green tubing are available in sizes 1/16 inch to 1/2 inch. The Assorted Color Kit has a total of 133 pieces and contains seven colors: black, red, white, yellow, blue, green and clear. The Black Kit contains 102 pieces, all 6" (512,4 mm) lengths (see chart below. )Additional sizes, colors and put-ups are available -please contact your 3M Electrical Products Sales Representative. Application Specifications: UL Recognized and CSA Certified at 600 volts at 257°F(125°C); UL File No. E-39100 and CSA No. 38227. MIL-I-23053/5, Class 1,2. AMS 3636 (Type I) and AMS 3637 (Type II). To Order: Reference specific product size, color and description on the following pages. Example: FP-301-1/4, white 6" (15,2 cm) pieces.